Bluegrass and Americana music pairs well with scenery. It’s a truth borne out every summer from the dark caves of Cumberland Caverns to the snow-covered peaks of Telluride to the harbor views of Newport. 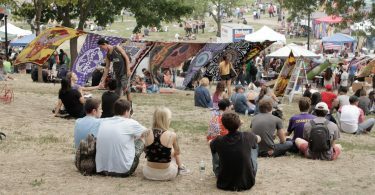 This weekend, Eastern Massachusetts gained its own scenic home for string band music as The New England Festy kicked off its first year in Canton’s Blue Hills Reservation. The backdrop was almost as much a star of the show as the music, with the stage situated in a wooded field on Prowse Farm, right at the foot of the Great Blue Hill from which the state takes it name. The festival is a northern offshoot of The Festy Experience, a festival organized by the band The Infamous Stringdusters that has run in the mountains of Virginia for the past seven years. Opening the day on the main stage, was 24-year-old up-and-comer Sierra Hull. Hull is a preeminently talented vocalist and instrumentalist who impressed with both her high, sweet singing and deft picking on mandolin and mandola. Her set covered everything from bluegrass standards like “Tennessee Waltz” to J.S. Bach’s “Invention 5 in Eb Major” to “Mad World” by 90s one-hit wonder Gary Jules. For the most part, her music explores the fertile ground in between these styles, arriving at an impressive blend of traditional songwriting, complex, classical-influenced instrumental passages and pop melodicism. The biggest names on the schedule were the Infamous Stringdusters themselves and Greensky Bluegrass. These two young bands have emerged in the past decade as the biggest young draws on the progressive bluegrass scene, a mantle they’ve taken from 90s forbearers like the Yonder Mountain String Band and Railroad Earth. The Dusters appeared first for an early evening set that showcased their bright, catchy songwriting and collective virtuosity. While the band’s originals can sometimes lean toward the saccharine, its instrumental prowess is unimpeachable and was clearly on display. Many songs led into extended improvisations that consistently stretched past 10 minutes, building from simple melodies to crashing crescendos. Anchoring the group’s sound was Chris Pandolfi, a New York native who was the first banjo principal at the Berklee College of Music. Greensky Bluegrass could be described as the Stringdusters’ in negative: where the latter’s music is tight, precise and overwhelmingly virtuosic, the former play it fast and loose, relying on breakneck rhythms, shout-along choruses and open-ended jams to whip their audience into a frenzy. What they lack in precision, they make up for in energy, and they had the crowd moving throughout their closing set. Their approach to songwriting also stands out from the progressive bluegrass crowd – there is a darkness behind their bouncy rhythms, with lyrics closer to songwriters like Townes Van Zandt or “Nebraska”-era Bruce Springsteen than the more traditional Stringdusters. 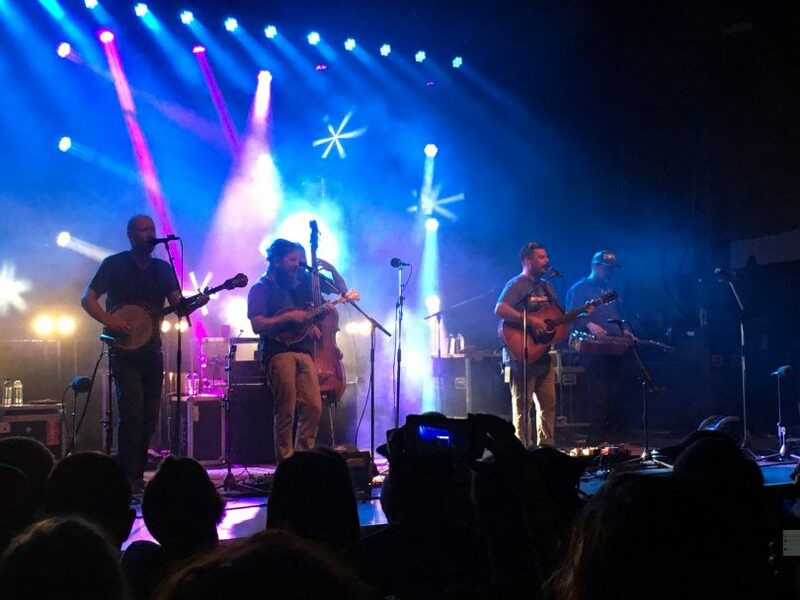 The day’s happiest surprise, however, came from the side stage across the field in the interim between the Stringdusters’ and Greensky’s headlining sets from Boston’s own Session Americana. The band consists of six scruffily dressed, middle-aged men who perform seated and strum guitars, mandolins and blow a harmonica while singing into a single microphone placed on a small table in the middle of the stage. Their songs were heartfelt folk and blues numbers in which the members constantly switched instruments and traded vocals. The combined visual and sonic effects served to make their set feel like an open-mic night at your favorite dive-bar, albeit with much more talented musicians. It was fitting to see some local boys take the stage just as the sun was setting on the Great Blue Hill, the end of a beautiful day for some singin’ and pickin’ in the woods of Massachusetts.